Medical use in Florida marijuana legalization has recently undergone some significant changes in the state of Florida with citizens voting on amendments to Florida marijuana legalization laws. Just as over two dozen other states have decided to allow the use of cannabis for medicinal and sometimes recreational purposes, the majority of voters in the state of Florida collectively decided it was time for our state to incorporate this revolutionary Florida marijuana legalization act into our lives. Though Florida marijuana legalization laws only call for the use of cannabis for medicinal purposes, it would come as no surprise that the state as a whole will witness positive overall effects from these Florida marijuana legalization amendments and continue to expand the legality of a plant holding such a diverse range of benefits. With these changes also comes an influx of medical marijuana dispensaries to meet the growing needs of patients permitted legal access to cannabis. In order to maintain order and control of these medical marijuana dispensaries and facilities, the Florida state government is also developing new Florida marijuana legalization compliance laws for the oversight of marijuana distribution services. This Florida marijuana legalization legislation has not been entirely finalized, creating a great deal of confusion surrounding the security of medical marijuana dispensaries. For this purpose, Security Camera King specializes in assisting medical marijuana distributors so that these dispensaries can open their doors for their patients without fear of being shut down due to non-compliance. 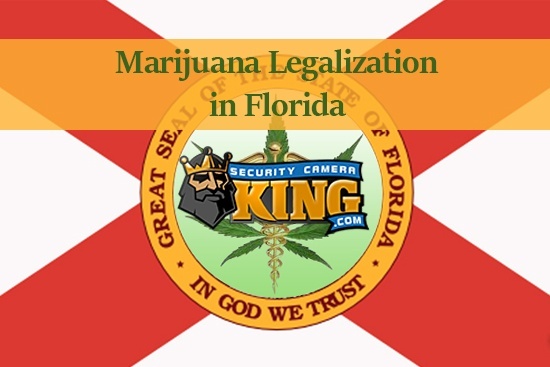 Security Camera King is a security and surveillance system distributor with a working knowledge of the intricacies involved in Florida marijuana legalization laws attributed to starting and running a medical marijuana dispensary. At Security Camera King we witnessed the first major shift in expanding the cannabis industry for a growing number of purposes and have been involved as a marijuana security company for those states that first introduced these legal revisions. To begin, let us give a brief history of the amendments in marijuana legalization laws from our country as a whole. As seen below, here is a timeline of the more important events that have eventually led us to the current point of having some form of cannabis legality in over half of the United States. 1937: The United States Federal Government passes the Marijuana Tax Act, effectively outlawing the sale and possession of marijuana throughout the country. 1952: The United States Federal Government introduces the Boggs Act, calling for extreme legal action and stiff mandatory sentencing for all drug-related offenses, including marijuana. 1970: The United States Congress passes the Controlled Substances Act, essentially placing individual drugs into categories, naming heroin, LSD, cocaine, and marijuana a Schedule 1 Narcotic as a part of President Nixon’s “War on Drugs. 1970-1978: State interest in seeking amendments to marijuana grows, leading Oregon, Alaska, and Maine to decriminalize marijuana while New Mexico initiates a brief marijuana research program. 1991: San Francisco, California opens the doors to the first medical marijuana dispensary in order to help people afflicted with AIDS. 1996: California votes to approve Proposition 215, introducing the first legislation that allows marijuana to be legally used for medical purposes. 2007: Oaksterdam University opens to deliver services that teach proper growing techniques, guidelines to opening medical marijuana facilities, and California state law navigation. 2012-2016: Colorado votes to pass Amendment 64, eventually permitting the commercial sale and recreational use of cannabis. This paved the way for individual counties and cities to implement their own form of marijuana regulation laws. 2016: Marijuana legalization laws finds its largest platform. All above states vote to allow the recreational use of marijuana while states Florida, Montana, Arkansas, and North Dakota all vote to extend their own form of marijuana legalization. While certain marijuana laws have already been put into effect throughout the country, Florida specifically added Amendment 2 to their legislation, effectively changing the previous law that limited the use of medical marijuana under the condition that it was a low-THC product. 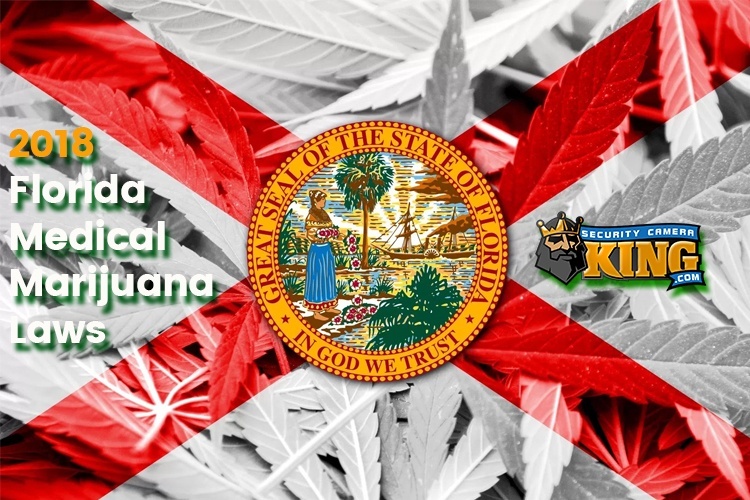 The overall foundation for these changes in Florida marijuana legalization is still being agreed upon by the Florida State Department as the specifications for medical marijuana regulations are in the process of being written and approved. The first Florida medical marijuana dispensary allowing the sale of low-THC products only opened as recently as July of 2016. However, with the passing of HB 307, the ability to receive other forms of medical marijuana was expanded and, as such, interest in opening medical marijuana dispensaries continues to build the closer we come to a formal introduction of these new Florida marijuana legalization regulatory laws. Security Camera King is an online distributor of high-quality security and surveillance equipment. We have two warehouse locations, one in Boca Raton, Florida and one in Wheat Ridge, Colorado. Our ability to experience firsthand the security necessities involved in compliance laws when opening and operating a marijuana dispensary or grow house in Colorado and its neighboring states has been an enlightening venture into gaining foresight for what will be asked of medical marijuana dispensaries opening in Florida. The key to staying in business as a medical marijuana dispensary is to make sure your entire operation remains in compliance with the state’s marijuana regulation laws. That being said, at Security Camera King we provide all the necessary security and surveillance equipment for any business interested in finding its own spot in the cannabis industry. Through our relationships with e-Line Technology, a developer and manufacturer of high-quality security and surveillance equipment, and Digital Security Guard, a remote video monitoring security service, Security Camera King provides every facet of the security service a cannabis company might seek. For a more thorough look at our extensive security and surveillance equipment, we recommend visiting our website and online store at the following provided link: Security Camera King. If you have any additional questions regarding our products and services Contact Us so that we may share our expertise in the marijuana security industry. 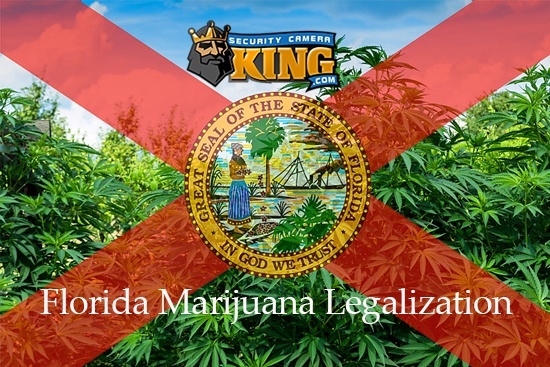 Florida is finally on the brink of truly implementing a revolutionary change to their Florida marijuana legalization laws, and at Security Camera King we want to be as important a part of the change as you.